Polenta is a Northern Italian peasant food. Because it is Northern Italian and my family is Southern Italian we never ate it growing up. It is basically the Italian version of grits. Which I never had until I went to the South of the US because it is a Southern dish in the US. To make polenta you do not have to buy a polenta mix, regular cornmeal can be used, the coarser the grind the better. The following is a simple recipe for Polenta. Use polenta as a substitute for rice or pasta. You can put almost anything over it. Whatever polenta you have leftover roll it into a log and refrigerate it over night. The next day you can slice it and fry the individual pieces in olive oil and again serve whatever you like over them. I sautéed some leftover spinach and sausage to make this meal. 1 Leftover log of polenta or Trader Joe's pre-made log. 2 - 6 sausage: vegetarian or meat chopped or you can use mushrooms. 1) Put 2 tablespoons of oil in a cast iron or other non-stick skillet. Heat on medium high. 2) When oil is very hot add slices of polenta. Brown on each side, approximately 4 minutes per side. 3) Put polenta a side and add 2 more tablespoons of oil to the skillet. Saute sausage until it is no longer pink. Put on top on polenta. 4) After you remove the sausage add the garlic then the spinach and seasoning. Sauté until the spinach wilts. 5) Pour the spinach over the sausage and polenta and serve. Seafood & Pork is an awesome combination. Together with Cajun seasoning over a potato this dish is bursting with flavor. 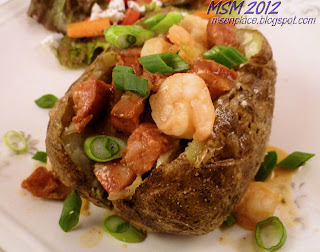 This recipe deserves recognition for both it's interesting flavor combinations and healthiness. Mmmm, I love grits and polenta! Thanks for the linky! Thanks for the feature, you guys! What an awesome way to start this morning! You are welcome. Did you see that we got a featured button for you to take. Thanks again, see you next week. I just love Polenta, your dish looks delicious! Thanks for hosting and have a fun week end! Thank you for inviting me, I have also pinned your party to my linky party board! Thanks so much I'll have to check it out. Glad I found you. Hope you come by next week too. 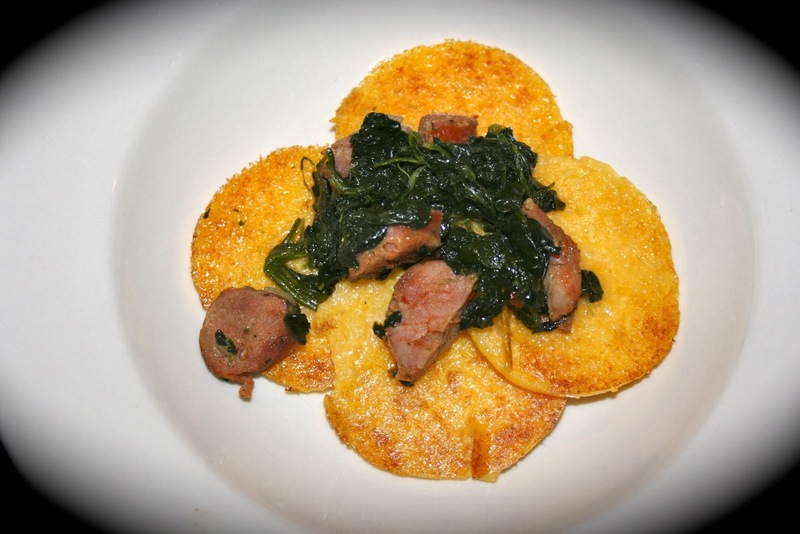 Polenta, spinach and sausage - how can one go wrong! Delicious! Your request to post my waffles has been fulfilled! :) Thanks for stopping by and commenting! Have a great weekend! Needed those waffles. I have some waffle making kids who are going to enjoy your recipe. Thanks for letting me know about your party! The polenta looks delicious! So glad I found your blog too. Glad you put the potato recipe up too. I'm sure they go so well together. Are you watching my house? I just made my husband and myself polenta with a salsa topping and cheese. Delicious. Now, I will have to try your recipe. If I type it up, soon, I will link it here. I have other recipes to link, as well. Got my Google cam on you right now, maybe you want to change out of those sweatpants before I put you live. So funny how something you've just eaten or are thinking of making crosses your path. Thanks for coming by, if you haven't already, grab our bottom so you'll remember to come back next week. Thanks so much for the invite and for hosting too! 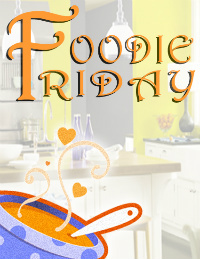 Thanks for the invitation to join your Foodie Friday! Hi Diane! Thank you for visiting my blog! I brought my Mediterranean Bean Burgers over to your party today! Mmmm I love polenta! I've only made it the creamy way, I bet it would taste delicious with a little crisp to it. Thanks for hosting! It is fantastic crispy. It takes a while to fry up. I'll be adding you to my Link Party page and following you....have a wonderful weekend! Thank you for the invite I am on kid duty from Friday night through Sunday no parties for me. I'm so glad you linked up. Thank you for the feature! I'll be sure to copy a button. And thank you, also, for hosting. I just happen to have some course ground cornmeal in the pantry right now and some leftover baby spinach in the fridge. Your polenta dish sounds perfect. You are very welcome. Just reading your blog. I'm a closet tree-hugger too. My husband said when he first meet me that I was "a little crunchy." Well, I still love my granola. Great to connect with you, see you again next week. this looks yummy! thank you for the invite!! You are so welcome. Hope to see you back next week. Your recipe will be so nice for a summer party, can't wait to use it. Thanks for hosting. I linked up my rainbow stuffed peppers with quinoa. How funny I was going through my cupboard and found some quinoa. I was just looking for a recipe to use it in, thanks. I enjoy reading all the recipes and thankful to all these wonderful cook & housewives who are willing to share. Happy weekend to all! I agree. Every week I'm so excited to see what new recipes will come my way. It is wonderful that so many people... for no money, sacrifice time for total strangers to share their foods. I think wanting to share your cooking is a really basic human desire. I get great pleasure out of doing it. Thanks for hosting another wonderful party :) Have a great week. I LOVE polenta! thanks so much for the recipe, will try it out. and thank you for inviting me to your lovely party! It is wonderful how nowadays, it is easy to have the feel of meat and be eating vegetables. This is a fabulous idea. Thanks for sharing with My Meatless Mondays. You are very welcome. Textured Protein is an amazing product. For the longest time my kids didn't even realize they were eating unchicken nuggets. They love unbreakfast sausage and all of the Morningstar Farm products. Thanks for sharing at Must Try Monday. I hope you'll sign up for the blog swap I'm hosting, too! Mmmm, this looks super delicious! Thanks so much for linking up to Creative Thursday this week. I can’t wait to see what you link up next week. Have a great day. What a great way to use polenta! Thanks so much for sharing at Mix it up Monday :) and for hosting too! Thanks so much, I really like the recipes that people post at your party. Hi Diane, Thanks for the invite! I love your blog! I just linked up to the party, thanks for hosting. I'm off to check out all the great shares and read more of you blog! Have a great weekend! Cheers! Your polenta sounds great. Thanks so much for sharing at Whimsy Wednesdays! This recipe looks so good. Would love to try this. Thanks for sharing.